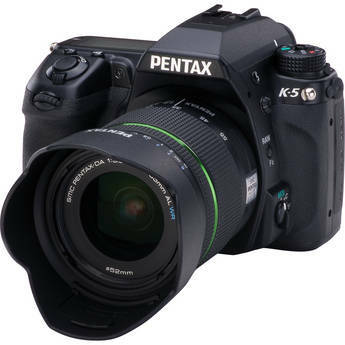 Pentax K-5 Digital SLR Camera W/18-55mm Zoom Lens (Black) for $1349.95. Expires 1/31. Pentax steps up and delivers a rugged top-of-the-line APS-C camera--the K-5 Digital SLR Camera Body (Black), featuring a terrific 27-82mm (equivalent) 3x zoom lens, low-noise 16.3MP CMOS high resolution sensor, sensitivity up to a best-in-class ISO 51200, 7 frames-per-second shooting capability and a responsive, high-precision 11-point auto-focus system. A high performing PRIME II imaging engine produces rich-gradation, very high resolution digital images. Plus, full HD video at 1920 x 1080 pixels. The K-5 makes advances in plenty of other areas as well, such as faster autofocusing speed, and an upgraded High Dynamic Range (HDR) function--for automatically combining 3 photos taken rapidly in challenging situations, for improved contrast and tonal range--that can even be used without a tripod. A bright, clear 3" LCD display with 921,000 dots resolution makes it easy to compose and review your images, or use the bright viewfinder for composition, secure in the knowledge that the highly accurate 77-segment metering system will deliver the goods every time. Shake Reduction image stabilization makes it possible to shoot at 2.5 to 4 shutter speeds slower without seeing camera shake in your photos. And all of this photo goodness is packed into a body of sturdy, lightweight magnesium alloy on a chassis of stainless steel that's built to last. The 77 special seals in the body give you a dustproof, weather-resistant and cold-resistant camera, for reliable operation in harsh conditions, at temperatures as low as 14°F (-10°C). An extremely reliable shutter unit provides a top shutter speed of 1/8000 second and is tested to 100,000 shutter releases. A stellar performer.